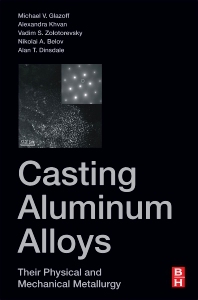 Casting Aluminum Alloys, Second Edition, the follow up to the fall 2007 work on the structure, properties, thermal resistance, corrosion and fatigue of aluminum alloys in industrial manufacturing, discusses findings from the past decade, including sections on new casting alloys, novel casting technologies, and new methods of alloys design. The book also includes other hot topics, such as the implementation of computational technologies for the calculation of phase equilibria and thermodynamic properties of alloys, the development of software for calculation of diffusion processes in aluminum alloys, computational modeling of solidification microstructure and texture evolution of multi-component aluminum materials. In addition to changes in computational predictive abilities, there is a review of novel casting aluminum alloy compositions and properties, as well as descriptions of new casting technologies and updates to coverage on the mechanical properties of aluminum casting alloys. Dr. Glazoff holds three doctorate degrees: Materials Science and Engineering; Chemistry, and in the spring of 2015 completed his doctorate in Nuclear Engineering from the University of Idaho. He has been involved for over 17 years in the R & D industry, as well as having held a number of academic positions. Her areas of interest include the study of alloys and ceramics development and characterization, phase diagrams and thermodynamics. She is a member of the Materials Science International Team MSIT (Global); Chairman of the Materials Science International Team Russia; Member of the Materials Science and Technology editorial board (MST, IOM3); and was a member of the international Scientific Committee of the Calphad XLII conference 2013. Vadim S Zolotorevsky is currently Professor of Materials Science and Light Alloys at Moscow Institute of Steel and Alloys, Russia. His areas of expertise include Physical metallurgy of Aluminium alloys, including nonequilibrium solidification, structure formation during solidification and its evolution during heat treating and plastic deformation, development of new Al-alloys. He has published 8 books, over 200 papers in scientific journals, and has been involved with over 50 patents and inventions. Nikolay A. Belov is currently the Chief Scientist and Professor of Materials Science and Light Alloys at National University of Science and Technology MISiS (former name “Moscow Institute of Steel and Alloys”), Russia. His areas of expertise include Physical Metallurgy of Aluminum alloys, including development of new Al-alloys (both casting and wrought), analysis of multicomponent phase diagrams, structure formation during solidification and its evolution during heat treating and plastic deformation. He has published 17 books, over 300 papers in scientific journals and conference proceedings, and has been involved with over 50 patents and inventions. Alan Dinsdale,Ph.D. is Professor of Materials Thermodynamics at Brunel University, London. he was previously an associate professor within a new scientific research centre concerned with the thermochemistry of materials within the Russian National University for Science and Technology (MISiS), where he was lead scientist in a rapidly expanding research group. He has been involved in the field of thermodynamics and phase equilibria since he joined the National Physical Laboratory in 1975. During a long career at NPL he has worked in a number of diverse aspects including the development of data for alloys, oxides, sulphides, molten salts, ionic liquids, cements and solders. He has also played a major role in the development of MTDATA, software developed at NPL for the calculation of phase equilibria from critically assessed thermodynamic data, one of the four major commercial software products in this field. Nationally and internationally he has been involved in explaining to industry the advantages in using phase equilibrium calculations to understand the behavior of materials and processes. He has been heavily involved in the Materials Chemistry Committee of the UK Institute of Materials, Minerals and Mining serving as chairman for a number of years, APDIC (the Alloy Phase Diagram International Commission) and also within SGTE where he was president for many years overseeing its expansion worldwide and supervising the publication of a number of volumes of data as part of the Landolt Boernstein series. An amazingly comprehensive review of the aluminum alloy casting system, along with plenty of ideas to explore for better casting alloys.